In this series of poems responding to Johann Sebastian Bach’s spectacular “Goldberg Variations,” New Hampshire State Poet Laureate Alice B. Fogel has paid homage to a 274-year-old masterpiece and, with the theme of spirit and embodiment that music—and life itself—evoke, has rendered from it a luminous new interpretation. Bach created the Goldbergs’ 32 sections using nearly all the styles of western European music at the time; Fogel responds in kind with a range of contemporary poetic styles, including narrative, lyric, and experimental, all confined within the 32-line structure she has borrowed from the composer’s 32-bar format. Interval mimics the “baroque” effects of overlapping melodies and harmonies by layering sound, syntax, and sense in multiple voices exploring self, identity, and being. In capturing the essence of this iconic masterpiece, through these poems Fogel has created her own music. Alice B. Fogel is the poet laureate of New Hampshire and works both as a teacher of creative writing at Keene State College and as an academic support tutor at Landmark College. She is the author of three poetry collections: Be That Empty, a National Poetry Foundation bestseller, and Strange Terrain: A Poetry Handbook for the Reluctant Reader. Her poetry has appeared in numerous literary journals and anthologies, and has been nominated six times for a Pushcart Prize. She lives in Acworth, New Hampshire. "I did it again the next night, and then more than occasionally, branching out . 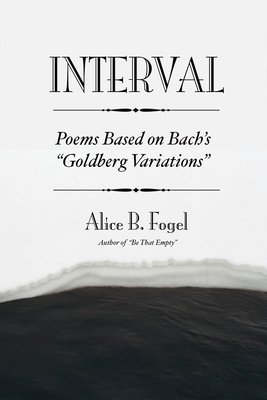 . . into Alice B. Fogel’s Interval as well. They were just enough, those poems, they perfectly occupied the space I had at the time for words and thought, and now I want more." —KJ Dell'Antonia, New York Times parenting blogger, "The Motherlode"